It is a breathtaking, one of the kind property well suited for intimate events and memorable festivities with friends and family. This new holiday rental flat offers casual sophistication with a lifestyle. Fully-furnished patio with sea-view and personal drop pool. Studio with queensize mattress and private porch with sea-view. 2 bath room. The flat holiday rental prices begin at 130 euro per evening. This flat provides a banquet for your spirit plus a delicacy for your feelings. - In case of cancellation more than twenty one (21) days prior to arrival, 100% of the total reservation fee is reimbursed. - In case of cancellation during the last twenty one (21) days prior to arrival, 50% of the rate of the total reservation fee is reimbursed. - In case of a no-show, guests pay for the reservation cost in full. The prehistoric settlement of Akrotiri reached its peak in c. 1650 B.C., just before the great volcanic eruption that buried the village and brought the Minoan civilization to an abrupt end. Now, you may visit part of the archaeological site that extends to a diameter of 10000m. There you may admire the ancient city, the houses, squares and streets. From the famous frescoes found on the site one may comprehend the affinity with Minoan Crete. 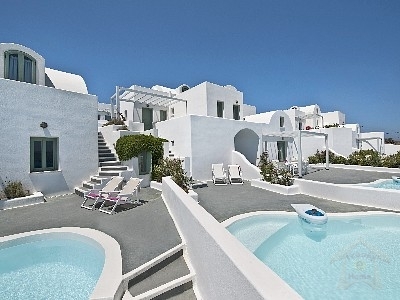 The contemporary village of Akrotiri revolves around a Venetian castle of the 14th century and offers views of the caldera and the towns of Fira and Oia. There are several beaches in the island for all kinds of beach life. Near us, one may swim at Kabia beach, Mesa Pigadia beach and the famous Red Beach. While just an 8min drive away, are the beaches of Perissa , Perivolos and Vlychada with its breathtaking rocks and the yacht marina. The area around the villa is semi-rural and quiet. It offers views and tranquility. Directions to Aura Marina apartments from the Airport Exit the airport area and arrive at the stop sign. Turn left and continue for about 1,7 km until you arrive at the Messaria cross section and eventual stop sign. There, you turn left to the direction of Perissa â�� Akrotiti (indicated by a sign). Continue for another 2,5 km where Segnor Zorba restaurant is, turn left and immediately right and uphill towards the direction of Perissa beach â�� Akrotiri. Continue for about 3 km until you arrive at the Akrotiri cross-section (on your left hand side you will see a big bakery) and turn right towards Akrotiri (indicated by a sign). Continue for another 2,5 km. At the crossroad turn right again in the direction of Kambia beach â�� Mesa Pigadia (indicated by a sign). After about 1 km and having passed Villa Maria pension house, make a left turn and continue for almost 100m. On your right hand side, you will see Aura Marina apartments. Directions to Aura Marina apartments from the Port Exit the port and continue uphill for about 3,3 km until you arrive at the stop sign. There, you turn right to the direction of Perissa â�� Akrotiti (indicated by a sign). Continue for about 2,4 km until you arrive at the Akrotiri cross-section (on your left hand side you will see a big bakery) and turn right towards Akrotiri (indicated by a sign). Continue for another 2,5 km. At the crossroad turn right again in the direction of Kambia beach â�� Mesa Pigadia (indicated by a sign). After about 1 km and having passed Villa Maria pension house, make a left turn and continue for almost 100m. On your right hand side, you will see Aura Marina apartments. There\'s a bus station nearby (600m). The best way, though, to see Santorini without limitations would be a vehicle rental, like a car, a quad or a scooter. We may arrange this for you through our coworkers. For a better service and as reception has limited opening hours (09.00 to 13.00), please advise usÂ of your arrival detailsÂ (flight number and air carrier or boat name and arrival time). Check-in time: not earlier than 14.00. Check-out time: 10.00. Please contact us for more information on the possibility of an early check-in. 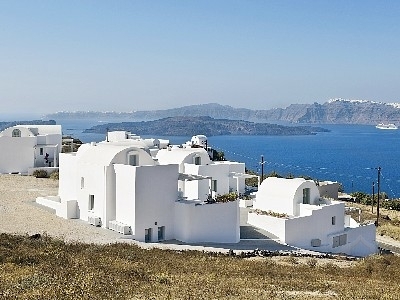 A vacation in Santorini offers many advantages as the island is multifaceted. Cool beach life and serious nightlife in Fira town, Perissa and Kamari beaches or quiet natural beaches and breathtaking spots for you to relax, dine. Wine tasting along the many wineries of the island famous for the white dry wine (assyrtiko and nychteri) as well as the sweet wine Vinsanto. Rates are daily and regard the maximum capacity of standard beds. For an extra bed, or for a baby cot, please add 50 euro for the stay. Laundry and maid service available on request.